There’s a peacefulness and contentment that only nature can inspire. Amid the majesty of mature trees and the cheerful burble of a meandering stream, stress melts away, replaced instead by awe. 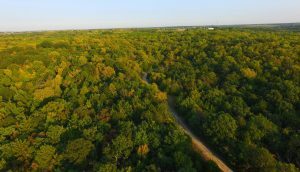 Within the expansive 47-acres of greenspace and heavily wooded forest ¼ mile West of K-7 on 119th St. in Olathe, KS , a rare opportunity awaits prospective homeowners of Timberstone Ridge, Olathe’s newest premier community. 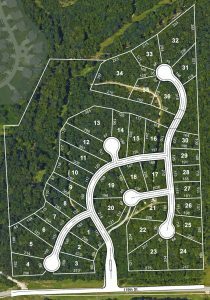 36 homesites averaging ¾ of an acre have been carefully carved out of the heavily wooded Olathe terrain, creating a secluded retreat that celebrates the full bounty of this extraordinary property. One of Johnson County’s oldest and most successful developers, Prime Development, recognized an exceptional opportunity to create a community that truly is unique. Timberstone Ridge offers a different approach to residential development and building. Rather than nature as a hastily landscaped afterthought, it’s instead the driving force behind the community’s planning and construction. 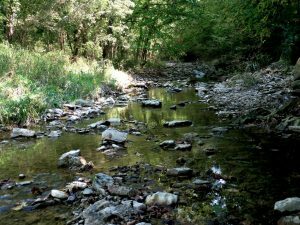 The central focus on nature doesn’t end with the community’s homesites. A thoughtful selection of builders will work with each homeowner to create stately custom homes from $1 million that complement and enhance their surroundings. Timberstone Ridge is just beginning to take shape with fully developed lots anticipated to be available Spring 2018. And for prospective buyers searching for a rare opportunity to combine the conveniences of suburban living with the beauty of nature, now is an ideal time to explore the possibilities that await at Timberstone Ridge. Because the community is in early stages of development, builders can work with buyers to accommodate a longer buying and building process, giving new residents ample time to create their dream home. With only 36 homesites, interested buyers should act soon to secure their place in this truly remarkable neighborhood. On-site tours can be made by appointment and a comprehensive list of community information is available online. For additional information contact Dennis Patterson at 913-851-5800.